The Nevada County 4-H Horse Program is focused on improving knowledge in the equestrian industry and safety for youth involved with horses. Project goals include safety awareness for horse and rider, basic riding skills, and horse husbandry skills. Additional goals include leadership and community involvement, where members are encouraged to share what they have learned with their community in various 4-H capacities. This is not a specialized riding program and instruction is general in nature. English and Western riding disciplines are both covered in instruction. Meetings are held in the arena and/or classroom monthly. Attendance at a mandatory orientation meeting is required prior to participation. Youth members must be 9-years-old by December 31 of the 4-H year. Members do not need to own a horse to participate. Horse Project offers activities for un-mounted members, including hands-on participation. The project, however, does not offer lesson horses due to liability and ownership constraints. The Horse Project meets once a month in an arena and/or classroom. Mounted meetings are held at the Nevada County Fairgrounds and are held based on weather and arena conditions. Classroom meetings are held at the Banner Grange Hall. Meeting dates and times are determined at the beginning of the 4-H project year. The Horse Project holds an annual Horse Day Camp in May for it’s members as well as an annual Play Day and BBQ in July. The Horse Project is active in the community and occasionally schedules work days as payment in kind for the use of facilities. 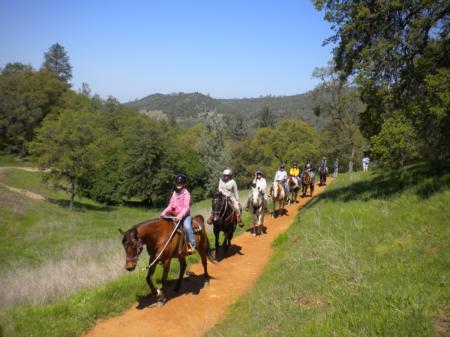 The Nevada County 4-H Horse Project offers the opportunity to set goals and achieve awards. Horse Mastership is a 6 level achievement program offered for members to test their knowledge and skill of horses with both written and mounted tests. Members receive an award certificate and pin for each achieved level, with a belt buckle being awarded upon the completion of Level 4 and an award saddle blanket for Level 6. The Horse Project also provides the 4-H Proficiency Program where members can earn a certificate and award pin for each level and an award belt buckle upon completion of level 4. If you have questions, please call Jennie Groves at (530) 288-0326.